The chief thing is to persevere faithfully till death in this devotion. 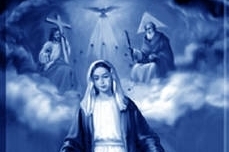 Can there be an easier or a more adaptable practice for all than the recitation each day of three Hail Mary’s in honor of the privileges conferred by the Adorable Trinity on the Blessed Virgin? One of the first to say the three Hail Mary’s and to recommend them to others was the illustrious St. Anthony of Padua. His special aim in this practice was to honor the spotless Virginity of Mary and to preserve a perfect purity of mind, heart and body in the midst of the dangers of the world. Many, like him, have felt its salutary effects. Later on, St. Leonard of Port-Maurice, the celebrated missionary, had the three Hail Mary’s recited morning and evening in honor of Mary Immaculate, to obtain the grace of avoiding all mortal sins during the day or night; moreover, he promised in a special manner eternal salvation to all those who proved constantly faithful to this practice. 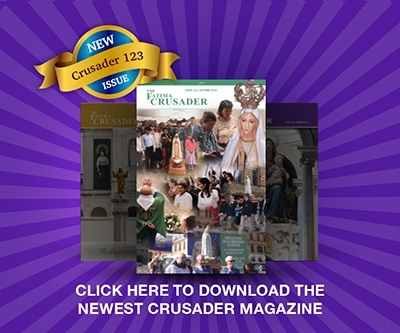 After the example of those two great Franciscan Saints, St. Alphonsus of Liguori adopted this pious practice and gave it his most ardent and powerful support. He counseled its use and even imposed it as a penance on those who had not adopted this good habit. Even persons consecrated to God will derive from this practice much precious and salutary fruit. 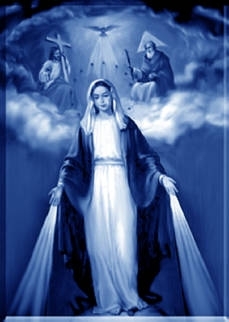 Numerous examples may show how agreeable the three Hail Mary’s are to the Divine Mother and what special graces they draw, during life and at the hour of death, on those who never omit them for a single day. This practice has been revealed to St. Melchtilde (13th Century) with the promise of a good death, if she was faithful to it, every day. His Holiness Benedict XV has raised the Confraternity of the Three Hail Mary’s to an Archconfraternity by according it precious indulgences with the power to aggregate to itself all Confraternities of the same kind, and to communicate them its own indulgences. With all my heart I praise Thee, Most Holy Virgin above all angels and saints in Paradise, Daughter of the Eternal Father, and I consecrate to Thee my soul with all its faculties. With all my heart I praise Thee, Most Holy Virgin above all angels and saints in Paradise, beloved Mother of the Son of God. I consecrate to Thee my body with all its senses. With all my heart I praise Thee, Most Holy Virgin above all angels and saints in Paradise, beloved Spouse of the Holy Ghost, I consecrate to Thee my heart, with all its affections and beseech Thee to obtain for me from the Most Holy Trinity all the graces necessary for salvation.